When Lu Chen performed the die and mirror trick on TV, the effect called Dice Illusion became an instant hit among magicians world-wide. It was so popular that a version 2 with an improved gimmicked die was later marketed. Now, Hong Kong’s magician Albert Tam has re-released his Illusory Reflex trick. In effect, it is the same as that performed by Lu Chen. Albert is quick to point out that he was the creator and manufacturer of this great effect. Way back in 1986, he came across a trick with a wooden die in which its non-painted spots became colored when put into a tumbler of water. He noticed the same effect when this die was reflected in a mirror. He then developed the effect known as Illusory Reflex, and started manufacturing and marketing it. It ceased production in 1992 because of the difficulty of making the special die. Then in 2009, when Lu Chen performed the effect on TV, it was rejuvinated and marketed by others as Dice Illusion. For those who are not familiar with the effect, here is the description. A die with blank (non-painted) spots (indentations on the die) and a small mirror are examined. The performer speaks of another dimension when things are reflected in a mirror. When he places the blank die on the mirror, its reflection shows a fully painted die with black spots with the number one dot which is in red. It is truly facinating to see a blank die physicallhy next to its painted reflection! The performer then proceeds to turn things around. The physical die becomes fully painted while its reflection in the mirror is of a blank die! This is as weird as the first illusion! Finally, the mirror is slid off the die and its reflection becomes a reality – the performer is now holding 2 dice, one blank die and one painted die in his hands! You receive 3 dice: a fully painted die, a non-painted die, and a gimmicked die. You are also supplied with a small mirror, and 2 black velvet carrying bags with the manufacturer’s monogram printed on them. The final item is an instructional DVD. All these are packed in a very nice black box with a magnetic cover. This product is limited to 280 sets. You receive a card signed by Albert Tam that indicates your set number out of the 280. The DVD is well-produced. In it, Albert related the genesis of this effect and its history. He also mentioned that he got his inspirations from Lubor Fiedler’s Shock Dice and Paul Harris’ Twilight effects. There is also a similar effect from John Kennedy called Mirror Dice. Albert performs and explains 2 routines – one involving a spectator, and one in which the magician performs alone. He also discusses 2 variations with the props. In one presentation, a blank die has a painted die reflection. This reverses itself so that the die is now painted while its reflection is that of a blank die. Finally, the die is pushed through the mirror and it emerges on the other side as a blank die. In the second variation, a blank die is shown to have a blank die reflection (which is normal). With a wave of the hand, the reflection is now of a painted die while the physical die remains blank! Although the illusion requires a certain line of sight from the audience, the special construction of the gimmicked die ensures that there are few angle problems to worry about. The effect is best performed one-to-one or for a small group of spectators. Properly performed, the effect on the spectators is truly fantastic. The dice are very well made. You receive 2 small carrying velvet-pouches, and everything is nicely packaged in a handsome black box. This is a professionally-produced prop and it is a limited edition reelase. The investment may appear to be a little on the high side. But what you get is a collector’s item that you will use in your performance, and the effect will wow the audience. Marc Oberon has won numerous prestigious international magic awards. His awards include the European Close-Up Magic Championship (2005), the International Brotherhood of Magicians (2006), the Macmillan International (2007), the SAM/IBM Magic Championships (2008), and the FISM World Championship Close-Up Magic Beijing (2009). His consistency in winning awards indicates that there is something about his performance of magic that sets him apart from other magicians. 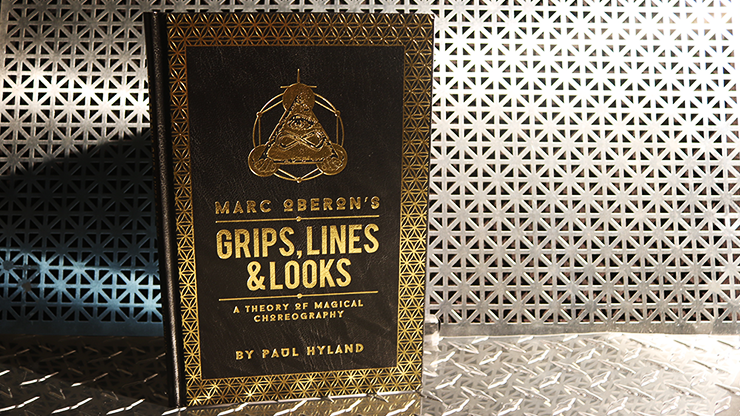 Now, he reveals his personal system of magical choreography in this beautifully-produced hardcover book of 125 pages. It is amply illustrated with photographs and also comes with a DVD that shows you visually how he applies his system to ten magical effects. “Grips” define the manner we hold or handle our magical props, some of which are meant to be seen by the audience, while others are not meant for the audience’s eyes. “Lines” refer to the way we move our hands and body when we perform the magic. “Looks” concern the way we look at our audience, and they include our facial expressions. All these three elements work in concert to bring about the illusion that what we do is pure magical, where there seems to be no logical explanation for it. Marc goes into details on how to achieve maximum impact on each of the three elements. He also mentions about scripting, pattering and the use of music. He then answers the most important question: “If your movements, gestures and patters are all painstakingly choreographed, how can your act ever appear fresh?” His answer provides one of the objectives of the book. In the second section of the book, Marc explains ten effects, and shows how he applies what he discusses (in the first part of the book) to each of them. This is captured in the DVD where you can actually see Marc Oberon demonstrating all ten effects. Another Night At The Bank – this is Marc’s take on John Archer’s Bank Night effect with envelopes. Marc uses five colour envelopes and includes an interesting twist in the climax. Clear Thought – it is a book test using a book of symbols. Spectator No 1 transmits his chosen symbol through a crystal ball to Spectator No 2. Here you get to learn Marc’s book force and how to make a symbol or drawing appear in an, otherwise, empty and clear crystal ball. Triangulation – a brilliant method of predicting which one of nine digits will appear in one of the three different symbols. Smoke, No Mirrors – performer attempts several times, but to no avail each time, to light a cigarette with a lighter. Each time he attempts it, either the cigarette or the lighter disappears, and the other item suddenly appears. Note Afloat – Marc’s presentation of the ‘floating note’ using Jon LeClair’s method. Free Flight – Marc’s presentation of the 3 Fly effect using the TUC gimmicked coin from Tango Magic. Okito Re-Boxed – Marc’s Okito Box reversal move. Ring Away – how to steal a finger ring inserted in a non-gimmicked ring-box. Spellbinding Change – Marc’s own take on the Spellbound coin move. Just One Coin – Marc’s coin vanishes and appearances. 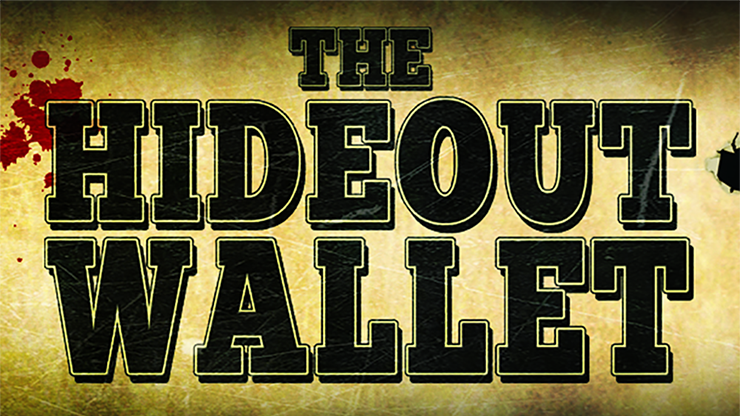 Alakazam Magic has purchased the rights to the Hideout V2 Wallet from Outlaw Effects. This is a good thing because Alakazam Magic specializes in mentalism effects and a gimmicked wallet such as this is primarily used in mentalism. Alakazam Magic has slightly redesigned the wallet. What you receive are the Hideout V2 (version 2) Wallet and an instructional DVD. The wallet is a bill-fold type wallet made from leather. It is very well made by Tony Curtis Magic for Alakazam Magic. • Pockets or slots for billets. There is a generous supply of these pockets. They are also designed to be wide and deep enough for a poker-sized playing card to be placed lengthwise in them. • Switching device. The panels that contain the items to be switched can be magnetically-locked. • Peeking-device. There is a window panel made with a special filter that provides some cloaking function to aid you in secretly peeking the information. The performer borrows 2 bills from the audience. They are folded with their serial numbers hidden inside, and placed in the wallet for safe keeping. Another spectator decides on one of the bills. The performer can instantly divine and write the serial number of this bill on the back of his business card. The performer shows that he has a face-down prediction card as well as a £5 note inside his wallet. 5 different ESP cards are mixed and one random card is freely chosen by a spectator ,and placed aside on the table face downwards. The performer takes out his prediction card from the wallet as well as the £5 note. The £5 note will be his default if he fails to predict the correct card. Both the selected card and the prediction card are turned over to show that they match exactly. The performer gets to keep his £5 note. Spectator writes the name of a random object on the back of the performer’s business card which is then inserted face downwards in his wallet for safe keeping. A book is introduced and the performer projects a page number to the spectator. The spectator names the page number she apparently receives from the performer, and remembers the first word on that page in the book. The performer then takes out a prediction from his wallet and shows that the spectator has indeed read the exact same word in the book. The performer then proceeds to draw a picture of the object first thought-of by the spectator. 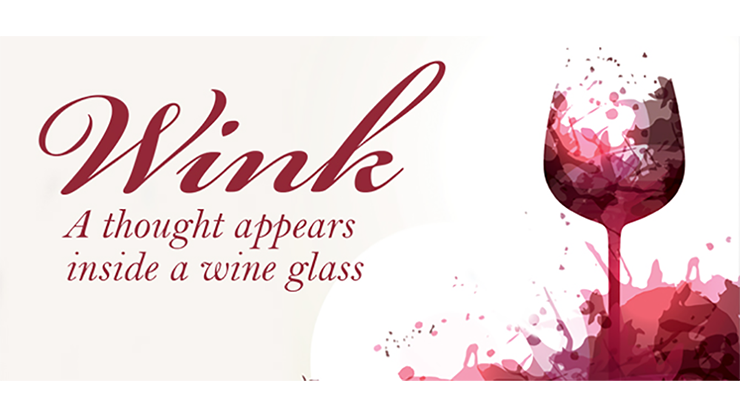 If you are looking for an unusual and mysterious effect with a borrowed glass of wine, Wink may be what you want. In effect, you hold a glass of wine in front of a spectator and she suddenly sees the name of her selected card appears inside her wine glass. Just as mysteriously, the name vanishes and the wine glass can be handed out for examination. You receive a special set of gimmicks and an instructional DVD. The DVD is well produced and Darryl Davis and Daryl Williams (The Other Brothers) take you through everything that you need to know in order to perform Wink. Basically, Wink allows you to reveal whatever you can force, inside a glass of wine. The gimmicks supplied allow you to reveal a number, an ESP symbol, two simple shapes, an animal, and three different playing cards. The good thing about Wink is that whatever you can force, you can reveal with Wink. You are therefore supplied with blank gimmicks that allow you to customize and make your own force reveals. You are taught how to prepare the gimmick, store the gimmick, load and unload the gimmick. Although it is best performed with a glass of wine, The Other Brothers also teach you how to use the gimmick with a bottle of mineral water. Wink is basically for performing one-to-one. You are also taught how to perform Wink for a larger group of audience. The effect here takes on a different twist. One of the spectators becomes the magician and can divine the card thought of by another spectator. The audience is mystified and has no idea at all how this spectator can reveal the thought-of-card of another spectator. Finally, The Other Brothers teach you how to force a card, a number, two shapes and an animal. You may think that these are standard forces already used by most mentalists. Pay careful attention to their discussions on the forces – they contain valuable insights. Their method of forcing a card is one of the most deceiving. VCM is an abbreviation for Visual Card Magic. 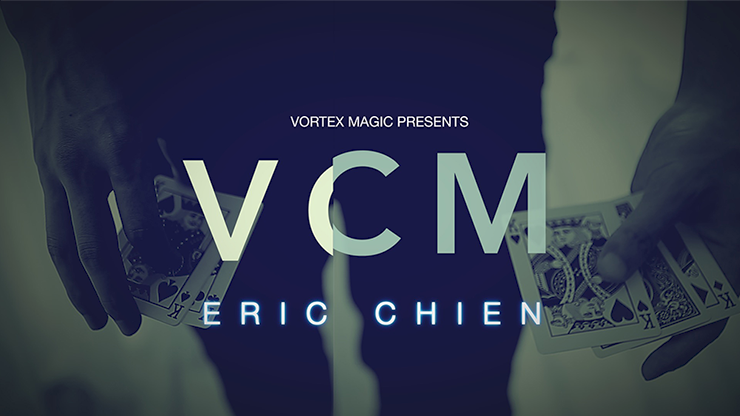 You receive a DVD which features six highly visual card magic from Eric Chien. Not much is known about Eric Chien, except that he is very good at sleight-of-hand magic and particpated in and won numerous magic competitions in Asia. Even in this DVD, he does not reveal his face when performing and explaining his card routines. Your purchase of this DVD contains a password that enables you to download a bonus video, that gives you additional materials to two of his routines, as well as the credits which he did not include in the VCM DVD. Eric shot this bonus video himself using his smart phone in his hotel room when he was working in China. Here is where you get to see Eric Chien’s face. Eric was first noticed by the magic community with his first DVD on coin magic simply entitled COIN. True to the title of this DVD, each of his six routines is highly visual card magic. His magic is direct and beautiful to watch, however it will take a lot of hard work for you to master the various sleights with cards, that will enable you to perform each of his 6 routines. It requires intermediate to advanced card magic skills. 3 red cards are clearly displayed and placed face up on the table. Similarly, 3 black cards are shown and placed face up on the table on top of the 3 red cards. Without any moves, the cards are spread face upwards, and the red and black cards now alternate. 3 cards are placed face downwards on the table. The other 3 cards show a black card sandwiched between 2 red cards. With a shake of the hand, the black card mysteriously moves downwards to become the last card. With another shake of the hand, this black card changes into a red card. All the 3 cards are now red. The 3 cards on the table are turned and spread face upwards – they are the 3 black cards. You will need to learn the Double Deal where you simultaneously deal the top and bottom cards of a small packet of cards. You will also be taught the Hofzinser Spread Cull and the Spread Colour Change. 4 Aces magically shoot out of a shuffled deck into your other hand. This is truly a visual production of 4 of a kind. In a variation of this, 3 cards shoot out of the deck. The deck is dribbled, and a fourth card is caught in the middle of the dribbling and turned over to reveal an Ace. The 3 cards that were shot out of the deck earlier are then turned over to reveal they are the other 3 Aces. Eric uses a short card to aid him in accomplishing this beautiful 4-card production. A selected card is sandwiched face downwards between 2 red Jacks. Mysteriously, this card vanishes and reappears between 2 black Jacks held in the other hand some distance away. Once again, this selected card is returned between the 2 red cards. Again, the chosen card travels magically from between the 2 red cards to be found between the 2 black cards. Immediately, all cards can be examined. 3 freely selected cards are lost in the deck. A packet of 4 Jacks are placed on top of the deck. The first Jack visually changes into an Ace. The packet is spread and the 4 Jacks have now changed to 4 Aces – trapped between the 4 Aces are the 3 selected cards. A double-face card is used to effect a clean visual change. Although Eric does not say it, it is possible to dispense with this gimmicked card and use sleight-of-hand instead. 2 cards are freely selected. The first selected card is placed underneath the empty card case. The second chosen card changes into the identity of the first chosen card. The card underneath the card case is then shown to be the second card. This card is then placed inside the empty card case. The first chosen card then changes into the identity of the second card, and the card inside the case is shown to be the first chosen card. This routine is the most difficult to accomplish, but it appears to be the most magical effect. You will be taught how to secretly “shoot” the top card so that it can magically appear underneath an object placed on the table. This is a stunningly visual production of 4 Aces from a deck of cards. It is most visual when performed standing up. You will be taught Chad Nelson’s Clip-Shift as well as the Top Shot move. On the label of the DVD is printed a password that enables you to download a bonus video from the internet. The bonus video is like an after-thought from Eric Chien after he produced this DVD. The bonus video provides additional materials to both Oil & Water and Collectors 2. In the case of Oil & Water, Eric teaches you a version using only 2 red and 2 black cards. Eric has worked out a signed card version for Collectors 2. Each of the 4 Jacks are signed by the spectators. The Jacks magically change to Aces, and 3 of the signed Jacks are later found to be in different pockets of the performer. The final signed Jack is inside a locked box which the performer brings out during the routine, before the 4 Jacks discover the 3 selected cards. The final segment of the bonus video has Eric crediting his sources for all his materials in the DVD. Apparently, he has left this important part out in the DVD. The running time for the DVD is about 40 minutes, while the length of his bonus video is just over 20 minutes. Apparently, Eric Chien does not mind using a gimmicked card or two just to make his magic more visual. After all, he titled this DVD – VCM (Visual Card Magic). With a sharpie, Four spots are drawn on each corner of a Post-It pad. One by one, with the rub of a finger the spots are visibly moved to one corner of the pad. The top sheet with the accumulated spots, is now peeled off and given away to examine. The written description pretty much summarised what the spectator sees for this effect, but the video demo is not really what was seen. The demo has been edited so that all the secret and necessary “moves” are not shown. Having said that, if you were to ask a spectator what they just saw, they’ll probably describe it as what the demo has shown. This routine is based on Al Schneider’s Coin Matrix. It’s a brilliant routine and all coin workers will have a version, or two. However, you’d need a table to perform Coin Matrix, not quite possible for most strolling magicians. Then came The Matrix Pad. This effect is simple and easy to understand. Your spectator gets to keep the Post-It pad sheet at the end of the routine. The method is easy and you’d need twenty seconds preparation time every time you perform it. The subtleties taught are quite effective, leading to a more believable performance. The weakest point in the routine is when you need to move the last spot to the corner. With proper misdirection, this can also be taken care of, so it is not really an issue here. You are supplied with a prepared gimmick made with a Q-Connects pad. I am not sure if you can easily get this brand anywhere. If you want to use 3M, it is not a problem as you are supplied with another gimmick to make your own. The size of the pad is pretty standard , i.e 3” by 3” . You will need this size as the gimmick is made for such size. You can use any color pad you want. At US$29.95, I think this is very reasonable as you get gimmicks for two sets. The DVD explanation is very clear, and it is easy to learning this routine. This effect is easy to perform, easy to understand and the spectator gets to keep the paper as a souvenir – a most suitable form of magic for table-hopping as the pad takes up little pocket space. If you are restaurant-magician or walkaround magician, I encourage you to add this to your repertoire. For hobbyists, it’s the same, and I’m sure your spectator will enjoy it. 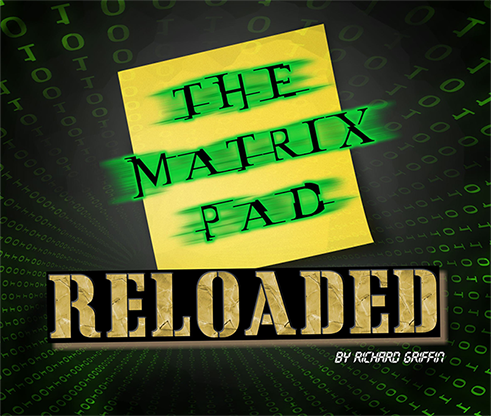 If you have read the original ‘The Matrix Pad’ review before, you’d know that the above review is exactly the same. It’s the same because even though this is an updated version, there is no significant difference that warrants an upgrade if you already have the previous version. There are 3 main differences in this updated version, the gimmick is stronger, with a box for easy storage during your walk-about performances and lastly, the price of US$39.95, a difference of $10 from the original. If you don’t have this effect, you should consider it as it is rather strong.